Xperia Z5 Dual delivers an incredibly fast and accurate 0.03-second auto-focus by combining two different technologies.Get 5 times closer to your subject without losing quality, thanks to the power of Sony’s camera sensors, lenses and exclusive Clear Image Zoom technology.See what happened when Xperia Z5 was put through its paces by DxOMark, the recognised industry standard for camera and lens image quality measurements and ratings. The magic of the night isn’t lost on Xperia Z5 Dual. Equipped with the next-generation Sony image sensor, you can capture beautiful night scenes as you see them – without the usual noise or blur.Xperia Z5 Dual delivers a design difference you can feel. A metal frame with precision engraving. A smooth, simplified form. And a frosted glass back that’s both gentle on the eye and cool to the touch. Xperia Z5 Dual’s power button has our new, integrated fingerprint sensor. The button is intuitively placed on the side of the phone, so you’re able to pick up and securely unlock in a single movement. With Hi-Res Audio and DNC support, you can hear music as it was meant to be heard and block out everything else.Everything you see is more vivid on this Full HD display with Sony’s BRAVIA TV technologies built in.PS4™ Remote Play lets you access your PS4 console through your smartphone and keep playing in any room. Xperia Z5 Dual lets you capture life’s greatest photo opportunities, before they pass you by. With its Hybrid Autofocus, our best camera phone yet is a master of speed and accuracy. Combined with 23 megapixels and five times more powerful image zoom, Xperia Z5 Dual is able to capture even the most fleeting moments. In sparkling clarity. On the first try. Rain happens. So do drops in the sink and knocked-over drinks. 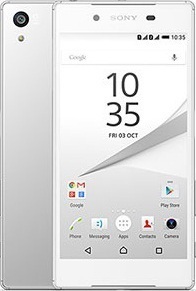 Xperia Z5 Dual has Sony’s leading waterproof* design and an IP68 rating. Because a little water should never ruin your day. What if every day had more hours in? Xperia Z5 Dual brings you up to two days** of ground-breaking battery power from a single charge. Listen to more music, talk for days and stay out longer without worrying. When you do need topping up, Xperia Z5 Dual has Quick Charge capabilities to give you a full day of power in just 45 minutes.